Today marks the 45th anniversary of the Apollo 11 landing and the first steps by humanity on another world. In honor of the man who took those first steps, we’d like to reprint the 8/28/12 piece we wrote on the occasion of his passing. 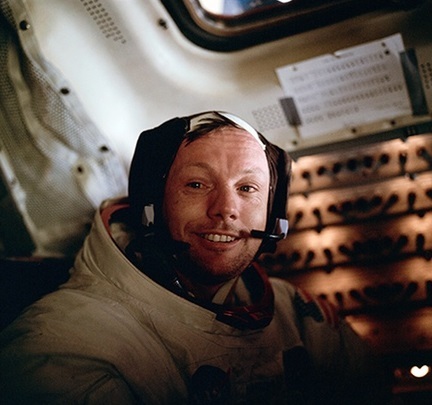 Astronaut Neil Armstrong passed away Saturday, and The Wall Street Journal reported something the pioneer once said about the success of the 1969 Apollo 11 mission – the odds of which he had placed at 50/50. Mr. Armstrong described the required reliability of each component used in an Apollo mission – statistically speaking 0.99996, a mere 4 failures per 100,000 operations – and pointed out that such reliability would still yield roughly 1000 separate identifiable failures per flight. In reality, though, they experienced only 150 per flight. What explained the dramatic difference? I can only attribute that to the fact that every guy in the project, every guy at the bench building something, every assembler, every inspector, every guy that’s setting up the tests, cranking the torque wrench, and so on, is saying, man or woman, “If anything goes wrong here, it’s not going to be my fault, because my part is going to be better than I have to make it.” And when you have hundreds of thousands of people all doing their job a little better than they have to, you get an improvement in performance. And that’s the only reason we could have pulled this whole thing off. . . . When I was working here at the Johnson Space Center, then the Manned Spacecraft Center, you could stand across the street and you could not tell when quitting time was, because people didn’t leave at quitting time in those days. People just worked, and they worked until whatever their job was done, and if they had to be there until five o’clock or seven o’clock or nine-thirty or whatever it was, they were just there. They did it, and then they went home. So four o’clock or four-thirty, whenever the bell rings, you didn’t see anybody leaving. Everybody was still working. The way that happens and the way that made it different from other sectors of the government to which some people are sometimes properly critical is that this was a project in which everybody involved was, one, interested, two, dedicated, and, three, fascinated by the job they were doing. And whenever you have those ingredients, whether it be government or private industry or a retail store, you’re going to win. All those textbook methods of performance reviews, pay incentives, etc. will come in handy when you get to the 50th or 100th employee, but right now you’ve got to be the one out front – with inexhaustible energy, enthusiasm, creativity, and a clearly articulated vision. Cohesion and esprit de corps are even more intangible. Where teamwork is built on the willingness of individual team members to subsume their own interests in favor of group interests, esprit de corps is built upon the willingness to sacrifice oneself, if needed, for the interests of the group. This is a level of commitment that few organizations in business achieve. Mr. Armstrong described himself (with characteristic humility) as: “I am, and ever will be, a white-socks, pocket-protector, nerdy engineer.” Perhaps that, and a bit more, Sir. Godspeed.